Welcome to the Best Western Mainland Inn & Suites! We are located only 10 minutes from Galveston Island and Cruise Terminal. If you're here for Space Center Houston, you're in luck because it's minutes away from our hotel in Texas City. From Moody Gardens to the world famous barbeque nearby, there's something for everyone when they stay with us. Schlitterbahn is in the neighborhood, and southern hospitality flows freely. Our friendly staff members are committed to making sure your trip is comfortable and memorable. Easy I-45 access makes commuting from our Best Western Texas City hotel simple. We're close to Tanger Outlet Mall, and many people come to town just to get great deals on fashion. However, an outdoor pool is also a siren's call few guests can resist. Relaxing poolside, working in a few laps or simply getting bronzed are also great ways to kick-start your vacation. 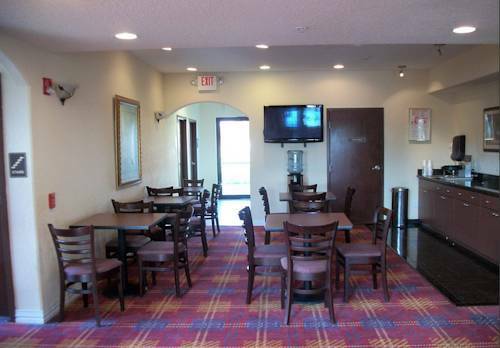 Enjoy a free breakfast and free Wi-Fi at our Texas City hotel. Start the morning with endless sizzling Texas waffles, eggs, a variety of breakfast meats, your favorite breakfast pastries, fruits and cereal or yogurt. The most important meal of the day is on us, and it ends with bottomless 100% Arabica coffee and fruit juices. As we are close to Galveston Beach, beach bumming is an activity you can partake in year-round. Whether you want to take a surf lesson or just swim in the warm turquoise waters, it's all possible and close to our property. Coast Guard service men and women as well as employees of Mainland Medical Center prefer our property for the location, value and service. Reserve your next stay at the Best Western Mainland Inn & Suites today and enjoy a fantastic stay at your home away from home. Olive Garden: .2 mile(s) from Olive Garden, Italian, open for: lunch, dinner, 11:00 a.m. to 10:00 p.m.
Ryans Steakhouse: .2 mile(s) from Ryans Steakhouse, American, open for: lunch, dinner, 11:00 a.m. to 10:00 p.m.
La Compadre: .5 mile(s) from La Compadre, Mexican, open for: lunch, dinner, 11:00 a.m. to 10:00 p.m.
Garden - .2 mile(s) from Olive Garden, Italian, open for: lunch, dinner, 11:00 a.m. to 10:00 p.m.
From: The north. Take Interstate 45 South and Exit 15, at the light take a left; stay on FM2004 and pass the 1764 Highway then you will see the Best Western Mainland Inn & Suites is on your right. From: The south. Take Interstate 45 North and Exit 15, at the light take a right; stay on FM2004 and pass the 1764 Highway then you will see the Best Western Mainland Inn & Suites is on your right. From: The east. Take FM2004 west the Best Western Mainland Inn & Suites will be on your left in front of Mall of Mainland. From: The west. Take FM2004 east the Best Western Mainland Inn & Suites will be on your right in front of Mall of Mainland.